Grant Morrison will return to DC superhero comics for the first time since finishing his acclaimed Batman Incorporated run with The Multiversity, which will (finally) be released beginning in August and stretching through 2015, Comic Book Resources reports. Each issue will be 40 pages in length, featuring art by Chris Sprouse and Karl Story, Ben Oliver, Frank Quitely, Cameron Stewart and more. 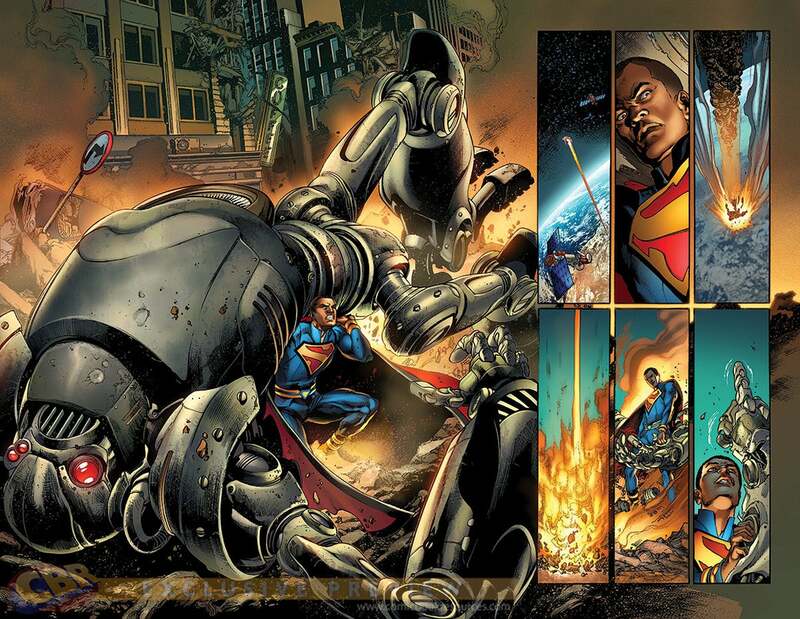 CBR has a first look at a two-page spread from the series' first issue, illustrated by Ivan Reis and Joe Prado with color by Nei Ruffino, Morrison himself provides a look at what readers can expect from the title as its storyline plays out from the second half of 2014 on into 2015. Morrison has further shared with CBR a statement on the series' launch, including lots of allusions to his trademark meta-textual "we are all part of the story" philosophy. "Prepare to meet the Vampire Justice League of Earth-43, the Justice Riders of Earth-18, Superdemon, Doc Fate, the super-sons of Superman and Batman, the rampaging Retaliators of Earth-8, the Atomic Knights of Justice, Dino-Cop, Sister Miracle, Lady Quark, the legion of Sivanas, the Nazi New Reichsmen of Earth-10 and the LATEST, greatest superhero of Earth-Prime -- YOU!" Morrison teased. Calling the project a "labor of love," he described the series as "Comprising seven complete adventures -- each set in a different parallel universe -- a two part framing story, and comprehensive guidebook to the many worlds of the Multiverse...more than just a multi-part comic book series, it's a cosmos-spanning, soul-shaking experience that puts YOU on the front line in the Battle For All Creation against the demonic destroyers known as the Gentry!"